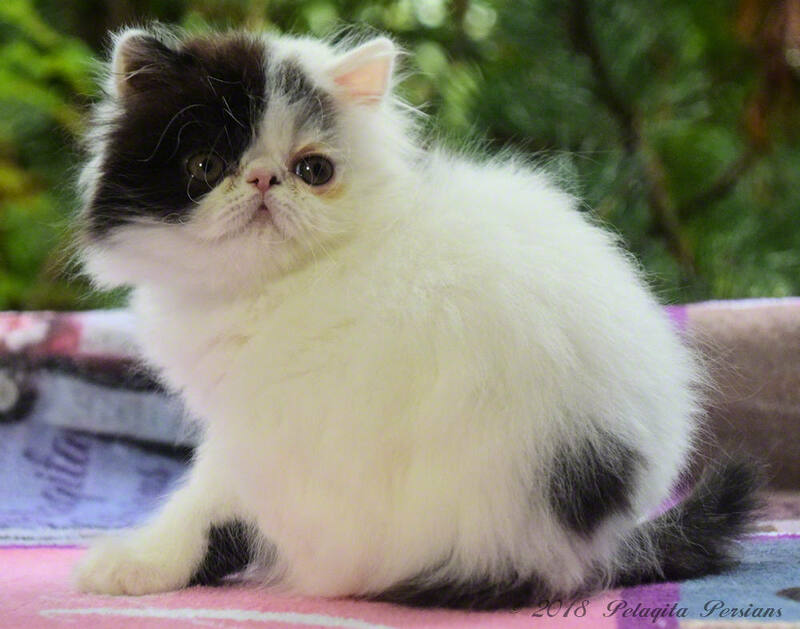 In this article, we will be addressing keeping a Persian cat's eyes clean. There are other articles on this site about coat maintenance, nails, teeth care, ear cleaning, and bathing. For any of these methods quilted cotton make-up pads for wiping the cat's eyes should be purchased. These pads can be found at your local drug store. Do not get the ones that have a lot of fluffy cotton-like fibers as they will get in the cat's eyes and cause irritation. The Eye and Facial Cleansing Solution by PinkPawPal helps in removing deep tear stains. Safe and gentle for use around the eyes, face, and body. Can be safely used as many times a day as you need to remove tear stains. The Eye and Facial Cleaning Solution works best when combined with the Tear Stain Removing Powder. This solution can be mix up and stored in an airtight container (i.e., Tupperware) for daily cleaning of the cat's eyes. To make this solution, purchase from the local drug store (Wal-Mart or Target have the best prices) a bottle of Betadine solution (10%) NOT the scrub. Mix a small amount of Betadine with tap water in an air-tight container; the mixture should look like a weak tea. Purchase a Multi-Purpose Solution for contact lenses (it will say on it that it removes "protein"). Do NOT get the scrub or rubbing solution. Purchase a bottle of Tylan 50mL at your local farm supply store. Tylan is usually stocked in the medicine section for large animals. Tylan is a liquid and is stored at room temperature. A bottle of Bausch and Lomb Ru-Nu Multi-Purpose Solution for contact lenses at the local drug store (Target and Wal-Mart have the best prices) will need to be purchased. The mixture of Tylan to the Multi-Purpose solution is 3 cc of Tylan to 4 ounces of Multi-Purpose solution. A syringe is needed to draw out the Tylan and inject into the Multi-Purpose solution. While I put this mixture on this list, I do not recommend the long-term use of any antibiotic, especially for the eyes. Soak a small wash cloth or a quilted make-up pad in cold club soda. Blot the stained area of the coat and gradually work the stain. Re-wet the pad with club soda frequently. For stubborn stains, let the coat soak in the club soda for about 20 minutes, rinse and re-soak with club soda. Club soda works better on new stains. Keep the club soda refrigerated as it works better when cold. If the carbonation is lost it will not work, so make sure the club soda is still fresh. WARNING: Be especially careful around the eye and do not get in the cat's eye. Club soda was not manufactured for this type of use and it is always better to err on the side of caution. Anna makes several natural products which are used for washing, and stain removal. Visit their website for more information on these products. There are a few eye powder products on the market that we find useful to help control tear staining. After cleaning the tears or stain from the cat's eye area, it is a good idea to "pack" the eye area with a powder (dry the eye area after cleaning the cat's eyes with one of the above washes). The powder will assist in eliminating the stain and prevent the new tears from sticking to the coat. To "pack" the cat's eye area, Qtips and the powder of choice is needed. Using a quilted make-up pad, wet it with the solution of choice and wiping from the outside corner of each eye wiping IN towards the nose to prevent the spreading of any stained tears over the face. Use a new pad on each eye to avoid cross-contamination. LIGHTLY, dry the area with a tissue or make-up pad. Depending on the particular cat, and the amount of eye weepage it has, determines how many times a day that it needs its eyes wiped. Some cats need only a daily eye wiping, others need to have their eyes done several times a day. Using a make-up pad, load it with the powder of choice and gently pat the entire area around and under the eyes. The two powders listed above are perfectly safe if a little gets in the cat's eyes. Take a Qtip; roll it in the powder, twisting it around in a complete turn to get a light coating of powder. Hold the cat's head firmly with one hand. Place the loaded Qtip at the lower edge of the eye area you want to "pack". Roll the Qtip against the direction of hair growth so that the powder is forced in between the hairs right up into the roots. 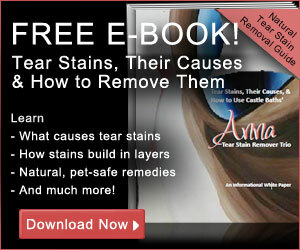 Anna's Products has written an excellent E-Book that is available for download on her site. Check out her products for keeping your Persian at his best! Click Here or on the banner below.